Push™, short for Practical Utility Shoulder Hold, is a messenger style concealed carry gear bag that offers multiple pockets with easy accessibility. 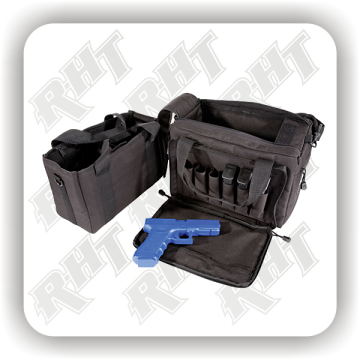 This bag is designed for rapid deployment from a vehicle to ensure critical gear is always close by. Push™, short for Practical Utility Shoulder Hold, is built from rugged 1050D nylon and features a large main compartment with two side-expanding pockets. The side pockets are sized to hold one-liter water bottles. A zippered pocket behind the main compartment has loop-sided Velcro to hold Back-Up-Belt™ System pouches or any other hook sided pouch. An adjustable shoulder strap with removable pad is designed to slip comfortable over your shoulder and is easily adjusted to suit your body type. The bag also features aero-foam padding on the reverse of the Push™ to ensure comfortable carry. Keep this bag on the front seat of your squad with all of your emergency gear so that you can exit the vehicle during a critical incident with everything you need. 5.11 Tactical Series is continually innovating and improving its products with input from field officers from around the world. The Push™ Pack is another example of our efforts to adjust to your needs by bringing you a new idea gear bags.